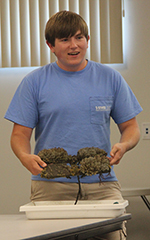 College students who hail from the Eastern Shore of Virginia presented their summer research projects to an audience of family members and donors at the Virginia Institute of Marine Science’s Eastern Shore Laboratory in Wachapreague last week. This year’s interns were Kelsey Bisker (Franktown, Clemson University); Tyler Chandler (Melfa, University of Virginia); Emilee Dize (Onancock, James Madison University); Parker Kellam (Onancock, Washington and Lee University); and Justin Shaffer (Franktown, Virginia Tech). The internship program—now in its 7th year—is open to Eastern Shore students, both undergraduates who are home for the summer and students 16 years and older from area high schools. Selection criteria for the internships are highly competitive, with many more students applying than the four to five positions available. Paige Ross, senior marine scientist at the ESL and program coordinator, says, “This year—as in every year—there’s a lot of work we could not get done without the help of these interns.” With a field staff of about five people, Ross says the addition of five interns helps their field efforts immensely during the summer months. The ESL internship program is funded entirely by private donations and provides a unique opportunity for local students. With many of its participants focusing on marine-related majors at their respective universities, the program helps them gauge whether a career in marine science is the route they want to take in their future. Emilee Dize—who returned to the ESL for her third summer as an intern—is a rising senior at JMU majoring in biology. While she took a summer off to pursue other opportunities last year, Dize says she missed this program and was happy to return this year. The paid internship program is entirely funded by private donations. Private donors are Marsha and Rick Amory; Cynthia Bailey; Chris and Kirkie Bosworth; Barbara and Steve Johnsen; the E. Polk Kellam Foundation; E. Polk Kellam, Jr. and Roberta Kellam; Caramine Kellam; Lucius and Tata Kellam; Deborah and Peter Lalor; Page and Tom Young; H.M. Terry Company, Inc.; J.C. Walker Brothers, Inc.; Mary Stoddard; Bayshore Concrete Products Corp.; and Dr. Lucy Spigel Herman. “I am so thankful for the opportunity of having a paid internship that focuses on marine biology so I can come home during my summer breaks,” says Bisker. “I also like how this year was different from last. We had different scenery and we were in the lab more which made me more comfortable working with microscopes. VIMS’ Eastern Shore Lab is located on a 5-acre site in a facility that affords education and research opportunities not available anywhere else in the region. The lab offers classroom and field opportunities for instructors and students from VIMS; William & Mary; and numerous other colleges and universities in Virginia, other states, and other countries. An important part of the Virginia Institute of Marine Science, the ESL also plays a major role in the Eastern Shore economy. The ESL also offers a variety of public-education activities throughout the year, in addition to two undergraduate field courses currently offered through VIMS’ School of Marine Science. 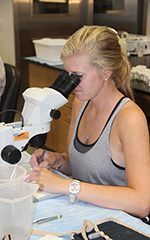 In addition to working on research projects, the summer interns participate in some of the educational programs offered at the lab during the summer.